The Action on Sugar group surveyed milkshakes sold in restaurants and fast food shops in the UK and found they contained "grotesque levels of sugar and calories". Freakshakes are milkshakes that also contain chocolates, sweets, cake, cream and sauce. A UK-based campaign group has demanded a ban on freakshakes and all milkshakes with more than 300 calories in the country. Freakshakes are milkshakes that also contain chocolates, sweets, cake, cream and sauce, the news agency BBC reported yesterday. The Unicorn Freakshake by British restaurant chain Toby Carvery topped the survey with 39 teaspoons of sugar or 1,280 calories. It is made with grape and raspberry flavoured ice cream, blackcurrant jelly pieces, milk, freshly whipped cream and topped with marshmallow, skittles and almond macaroon. That is more than half the daily recommended amount of calories for an adult and over six times the amount of sugar recommended for seven to 10-year-olds. It is the equivalent of drinking more than four cans of cola. The British Heart Foundation calculates an average 25-year-old would need to jog for nearly three hours or vacuum the house for five hours to burn off the calories. The researchers found that many other shakes contain more than half the daily recommended amount of calories for an adult. Action on Sugar, which is made up of specialists concerned with sugar and its effects on health, have called for mandatory traffic light-coloured nutrition labelling across all menus. The government is currently consulting on menu calorie labelling. 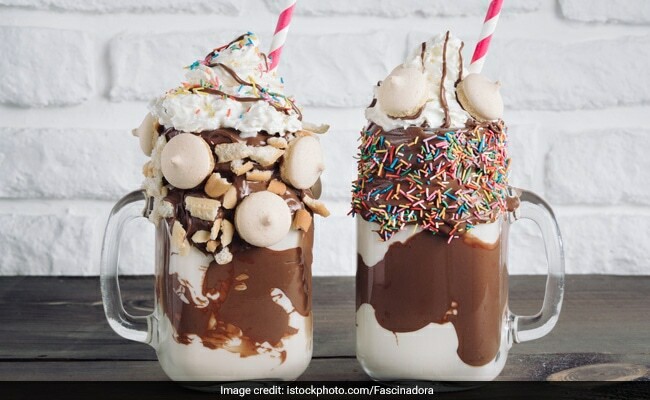 Freakshakes were invented in Australia, but have become increasingly popular in the UK in recent years and with their photogenic qualities are a popular posting on social media. Creamy Or Creepy? Insect Ice-creams Are A thing Now!